The Delaware Art Museum INvites you to join in celebrating the 10th anniversary season of its’ Concerts on Kentmere series, featuring performances by Pyxis, Wilmington’s premier piano quartet. The ensemble — Luigi Mazzocchi (violin), Amy Leonard (viola), Jennifer Jie Jin (cello) and Hiroko Yamazaki (piano) — will perform three concerts during the 2018-19 season, the final event featuring a commissioned work by David Schelat. The milestone season will also see a closer relationship between Pyxis’ repertoire and the exhibits. “We met with all the curators last spring before we planned our season because we wanted to see what we had to work with,” said Leonard. The first concert which takes place on September 27 provides the musical response to the work of conceptual artist Hank Willis Thomas. The commissioned exhibit — “Black Survival Guide, or How to Live Through a Police Riot” — tells the lesser-known stories of the 1968 riots and occupation of Wilmington through a series of fourteen retro-reflective prints drawn from the photographic archives of the Delaware Historical Society and The News Journal. Viewers become “activists” when they apply light to the prints revealing hidden images. Pyxis will complement the exhibit with a performance of Alfred Schnittke’s Prelude in Memoriam Dmitri Shostakovich. “There are many layers involved and secret meanings and things that aren’t immediately apparent,” said Leonard. “And we’ll be performing it in a very kinetic way, spreading ourselves out in the space.” The program will also feature a performance of Debussy’s cello sonata, a work written as the composer struggled under the physical and psychological oppression of terminal cancer. The artistic accomplishments of women will be the focus when Pyxis performs on January 10, 2019. “The Feminine Mystique” honors the work of pre-Raphaelite artist and mid-19th Century feminist and women’s rights activist Barbara Bodichon. Leonard and company will offer a musical response with works by such trailblazing composers as Germaine Tailleferre, Rebecca Clarke, Dora Pejacevic and Gwyneth Walker whose “Letters to the World” reflects on the poetry of Emily Dickinson. “Tailleferre was the only female member of the group known as Les Six and Rebecca Clarke was one of the first women to play in a symphony orchestra,” said Leonard. Pyxis’ final concert on May 2 will explore the relationship between color and sound. 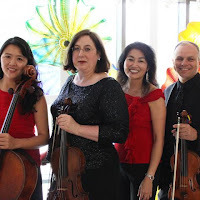 The ensemble will perform vibrant works by Brahms (Piano Quintet in F minor featuring guest violinist Dara Morales of the Philadelphia Orchestra) and Beethoven (the String Quartet in E-Flat Major nicknamed the “Harp” for its use of pizzicato). Concert dates: Thursdays, September 27, January 10, (Snow date Sunday, January 13), May 2. Prior to each concert, the museum's curator will offer a brief personal insight. Curator talks begin at 7:30 p.m. Performances begin at 8:00 p.m.